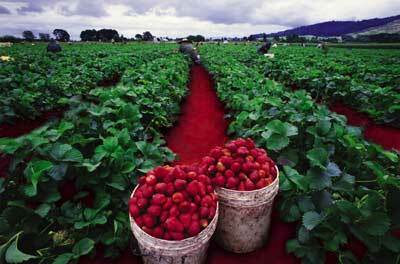 June is just around the corner and with it comes the start of strawberry season. Although you can find strawberries almost any time during the year, this is the time when they are fresh and perfectly ripe. There are a couple of recipes that I’ll share to highlight the great taste of strawberries during the next month. I found the first recipe I’m posting in a catalog for Penzeys spices. This is a strawberry bread recipe that we have also made as muffins. It is a wonderful recipe that I was pleased to come across and am now happy to be able to share with you. Preheat oven to 325˚. Grease and flour two 5-cup (4.5″ x 8.5″) loaf pans and set aside. Sift together the flour, cinnamon, baking soda and salt and set aside. In a large bowl, beat together the oil, eggs, vanilla extract and sugar until well blended. Gradually add the dry ingredients, stirring just until all the ingredients are moistened. Stir in the strawberries and nuts. Spoon the batter into the loaf pans and bake at 325˚ for 1 hour and 10 minutes. Cool in the pans for 10 minutes before removing from the pans to cool on a wire rack.